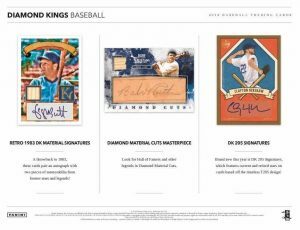 – Find memorabilia of the all-time greats in DK Materials, Jersey Kings, Bat Kings, Studio Portraits Materials, and Diamond Deco. 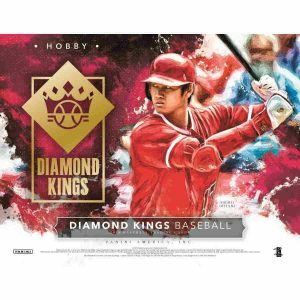 – Jersey Kings and Bat Kings return to Diamond Kings in 2018! 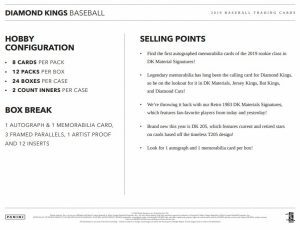 – We’re throwing it back with our Retro 1982 Diamond Kings Materials Signatures, which features fan-favorite players from today and yesterday! 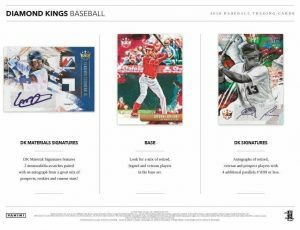 DK MATERIALS SIGNATURES – DK Material Signatures features 2 memorabilia swatches paired with an autograph from a great mix of prospects, rookies and current stars! BASE – Look for a mix of retired, legend and veteran players in the base set. DK SIGNATURES – Autographs of retired, veteran and prospect players with 4 additional parallels #’d/99 or less. THE 300 – The 300 pays homage to 10 of the greatest pitchers in baseball who achieved the career “gold standard” of 300 wins. DK FLASHBACKS – DK Flashbacks features 20 players with photograph from their early seasons in the majors! 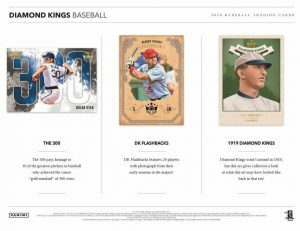 1919 DIAMOND KINGS – Diamond Kings wasn’t around in 1919, but this set gives collectors a look at what this set may have looked like back in that era! RETRO 1983 DK MATERIAL SIGNATURES – A throwback to 1983, these cards pair an autograph with two pieces of memorabilia from former stars and legends! DIAMOND MATERIAL CUTS – Look for Hall of Famers and other legends in Diamond Material Cuts. DK 205 SIGNATURES – Brand new this year is DK 205 Signatures, which features current and retired stars on cards based off the timeless T205 design!